This mausoleum was misidentified by the Daniells as the tomb of the celebrated Delhi poet Amir Khusrau, which lies nearby in the tomb complex of Nizamuddin. It is in fact the tomb of Mirza 'Aziz Koka, foster brother of the Emperor Akbar, who died in 1623/24. 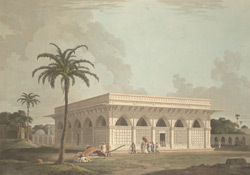 It is one of the earliest of a new type of Mughal tomb, the flat-roofed hypostyle hall, here encased in white marble, with white marble jalis or pierced screens around the sides. It is known as the Chaunsath Kambha or '64 pillared hall' from the number of its pillars: it consists of 6 by 6 bays, with pillars doubled round the periphery, and quadrupled at the corners.